These pork patties are spectacular as far as I’m concerned! So full of flavor! Aside from the caramalization and other great ingredients, the sauce has a ton of ground black pepper — this is typical of many Vietnamese sauces, and I think it’s what makes this dish (must be from the French influence in Vietnam). 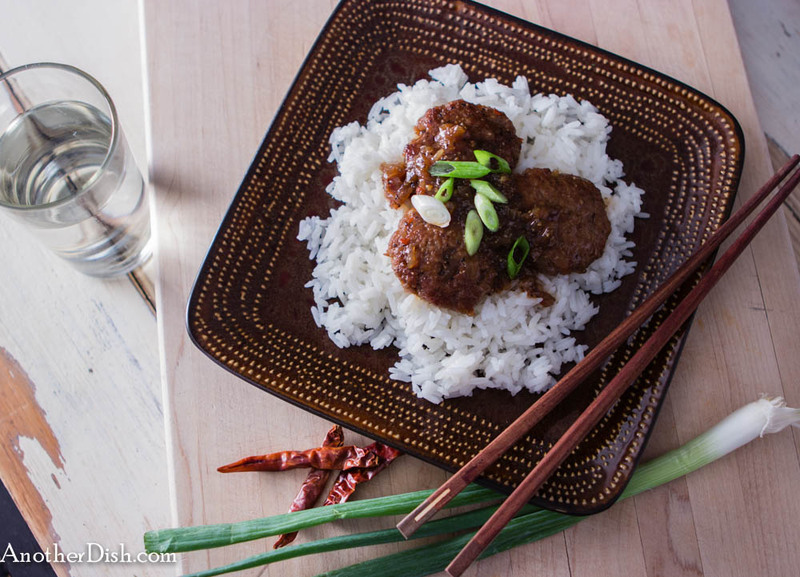 If you like Southeast Asia’s obligatory sweet, hot, sour, salty flavor combo, I think you’ll really like this dish! In a small bowl, mix together 2 Tbsp fish sauce with 1/2 cup water. Set aside. Heat 1 Tbsp vegetable oil in a large skillet over medium-high heat. Stir in remaining 1 1/3 cups chopped shallots. Cook for about 2 minutes, until softened. Add remaining minced chilies and garlic. Stir-fry an additional 40 seconds. Remove from heat and set aside. In a large bowl, combine pork, remaining 2 Tbsp fish sauce, remaining 1 1/2 tsp ground black pepper and the cooked shallots. Make 18 small patties (a little less than 1/4 pork mixture, at about 2 1/2 inches each in diameter). In a skilled large enough to easily fit all patties in a single layer, heat remaining 1 Tbsp oil over medium-high heat. Add patties and brown on each side (about 3 1/2 minutes per side). Turn heat off and remove patties from pan — wipe out pan with a paper towel. Add 1/3 water and 1/3 sugar to pan over medium heat and swirl gently until sugar is dissolved and mixture begins to caramelize (about 12 minutes — you should end up with a nice, copper-colored sugar-water. Remove from heat. Slowly add fish sauce/water mixture to sugar-water. Return to a medium-high heat and bring to a boil. Stir in the uncooked shallot/chili mixture. Cook about 1 1/2 minutes, until shallots have softened. Stir in 3 Tbsp tamarind purée. Add back the pork patties and stir to ensure patties are well covered in the sauce. Cover, reduce heat to low and simmer for 20 minutes (turning patties after first 10 minutes). Remove lid. Remove patties and set aside. Simmer sauce another couple of minutes until slightly reduced. Remove from heat. 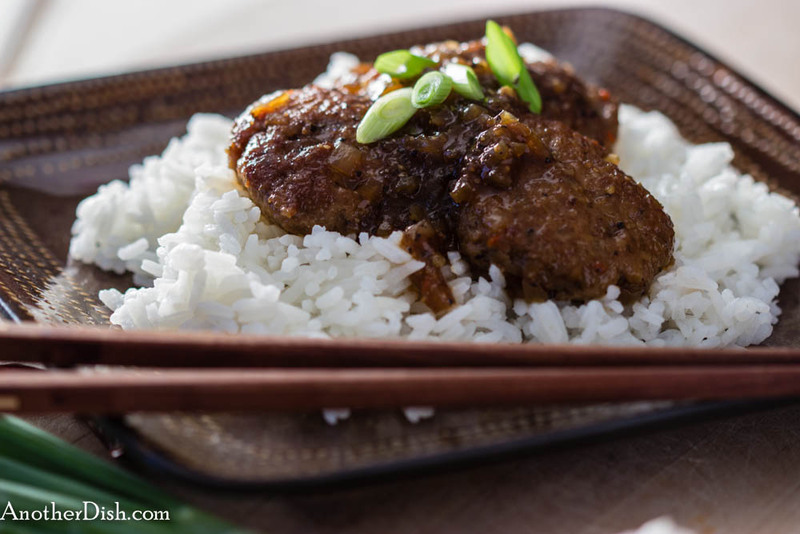 Serve patties over steamed jasmine rice, topped with sauce and sliced scallions. This entry was posted in Main Dishes, Pork, Vietnamese and tagged Chilies, Cooking, Food, Food Photography, Foodie, Jasmine Rice, Recipes, Southeast Asian Food, Spicy, Vietnamese Food on April 20, 2014 by AnotherDish. looks awesome! I love that ingredient list! great recipe! Thank you Paul — these are some of my favorite ingredients, in deed! It looks so good! Did you use palm sugar or cane sugar? The color is so nice! Thanks, Hari. I used cane sugar, but I also have palm sugar in the pantry. Perhaps that would have been a bit more authentic. I got the chopsticks in Laos — thought it was close enough to be appropriate for the shoot. Chopsticks from Laos! Now I understand why they have such nice ethnic “aura”. I love chopsticks but I have not been so lucky in collecting the nice ones. So far, the most interesting chopsticks I got are kabuki chopsticks (14 inches), Painted chopsticks (birds & flowers, Chinese style) and Chinese cooking chopsticks (they are HUGE and very useful). Hi Hari, yes, chopstick from Laos. I’ve seen the giant Chinese cooking chopsticks, and eventually I will add them to my cooking utensils — I do like cooking with chopsticks. I don’t recall seeing any chopsticks in Indonesia. I’m guessing it’s more of an ethnic Chinese tool there. Chopsticks are not that exclusively used by Chinese folks, here in Indonesia. They are, however, much associated with Asian food. Chopsticks are commonly found in multicultural places like Bali, Jakarta, Medan, Surabaya, etc. Please make sure that the chopsticks you get are food-grade, made of “good” wood or other safe material. Thanks for that info on use of chopsticks in Indonesia.